“I wanted to learn more about who they were and why they believed what they did,” Pond said. So in 2011, she traveled to Jolo, West Virginia, to meet and photograph Pentecostal serpent handlers, also known as Signs Followers. Soon, she focused her work primarily on Pastor Randy “Mack” Wolford and his family. But in May 2012, her project abruptly changed when Wolford, 44, died after being bitten by a rattlesnake during a worship service Pond attended. Pond continued photographing the service and later events as they unfolded. Some of the photos, which were published in the Washington Post and other publications around the world, led to a falling-out -- and later, a reconciliation -- between Wolford’s family and Pond. “I’ve spent six years with them, rebuilding the relationship after I hurt them so deeply,” she said. “It’s been a transition for me, between telling a story and sharing one,” she said. Last year, Pond was awarded the Center for Documentary Studies / Honickman First Book Prize in Photography for the project. In November, as part of that award, Duke University Press and the Center for Documentary Studies at Duke University published “Test of Faith: Signs, Serpents, Salvation,” a collection of photographs and text by Pond. In November 2011, Pastor Randy "Mack" Wolford poses inside his church, the Full Gospel Apostolic House of the Lord Jesus, in Matoaka, West Virginia. Mack strums his guitar while his mother, Vickie "Snook" Haywood, sings along during an evening Bible study in Bluefield, West Virginia. Mack mops his brow during a September 2011 serpent hunt in Panther, West Virginia. James Lloyd, Snook and other Signs Followers surround Mack after a rattlesnake bites him during an outdoor worship service in May 2012. Mack walks on a yellow timber rattlesnake moments after it bites him in Panther, West Virginia, in May 2012. Mack's mother strokes his feet as she waits for him to recover from the rattlesnake bite. Early morning sunlight on Mack's guitar case, which his widow, Fran, keeps in her living room. Pond is a freelance photographer based in Columbus, Ohio, the manager of the Fresh A.I.R. Gallery, and a multimedia content producer for the Center for the Study of Religion at Ohio State University. She has a B.S. and a B.A. from Northwestern University and an M.A. from Ohio University. Pond was at Duke in November for a talk and book signing to mark the publication of “Test of Faith.” She spoke with Faith & Leadership about the book and her broader work documenting faith and religion. The following is an edited transcript. 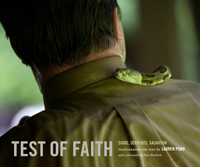 Q: Tell us about the project that led to your book, “Test of Faith.” How did you come to photograph serpent handlers? I read about them in an anthropology class in 2010, and I was floored that [the practice] existed. I had never heard of it. I’m not from a religious background to speak of, so to learn about people who risked their lives literally for their beliefs was striking to me, and mind-boggling. I wanted to learn more about who they were and why they believed what they did. I lived in Washington, D.C., at the time, and the following winter I had some time off and drove down to West Virginia. I made contact with someone in Jolo, which is one of the better-known serpent healing towns in the state, and went to a service. There weren’t any serpents handled that day, but I met some people and then went back a few more times and got to know the community a little. One person I befriended mentioned, “This pastor is having a service in this park tomorrow, so you should come.” That’s how I met Mack Wolford. He was leading the service. I made about five trips in 2011 for several days each. The first couple were just getting to know Jolo and the area, but then after I met Mack, I went back and shadowed him and got to know his family. Q: What were the services like? I was shocked at first. I think I expected the snakes to be aggressive. I don’t know a lot about rattlesnakes, but I know they’re wild animals, and they bite, and you don’t want to get near them. To see someone handle them with nothing happening -- they just kind of lounged around Mack’s body and didn’t fight him -- it seemed totally benign. It was shocking and mesmerizing, in a way. I wanted to know more about who they were. That’s why I kept going back and getting to know this family. Q: So who were they? Mack was originally from Phelps, Kentucky. His whole family is from there. Serpent handling tends to be a family tradition. It was passed down to Mack from his father, who also died from a rattlesnake bite. I’m not sure when they moved to West Virginia, but Mack moved around for a while for different jobs. He worked in construction and in window installation and in a coal mine for a while. He hurt his back and went on disability. After that, he began preaching full time and opened his own church. He was the spiritual bedrock for his family. His mother and sister are ministers, and it tied everyone together. Q: Your project became more than just photographer and subjects. You became friends? As a journalist, you’re taught to be a professional outsider. The rules are changing, but the ethical guidelines are that you’re not supposed to be involved with your subjects. You’re just there to report, so when I first met them, I was still trying to keep that distance, even though we had a family-relation rapport. It was his death that ultimately changed that. Q: Tell us about that, and about what happened in May 2012. Mack invited me down for another service. It was one year to the day that I’d met him, the day after his 44th birthday. So I went down and took my camera, though honestly, I wasn’t planning to take any pictures. The service itself -- there was just something off from the very beginning. I don’t know how to describe it, but the energy that I’d felt the previous year was not there. Everything seemed a bit rushed. It was this feeling I had that something was off, something was weird. Q: You didn’t see it? It wasn’t anything obvious? No. It was like that, and then he started to deteriorate fast. [Serpent handlers] don’t believe in getting medical treatment for snakebites, because they believe when they’re handling serpents, they’re performing God’s work, and if they’re bitten, it’s up to God whether they live or die. I didn’t really feel like I could do anything but take pictures at that point. I didn’t feel like I could intervene, knowing what their beliefs were, so I just kept documenting. Q: The previous fall, The Washington Post ran an article about Wolford and other snake handlers in Jolo, accompanied by your photos. And after he died, they ran your photos from that last day, and an essay that you wrote about how you had struggled with his death and your decision to shoot the photos. Tell us about that. Well, there was a second part to this story that I was ashamed of for a long time. When they took him back to his mother-in-law’s house to recover, they asked me and two filmmakers who were there not to take pictures of him without his shirt on. They had taken off his shirt, because he was uncomfortable and hot. Eventually, she told us to turn the cameras off. Standing there watching someone suffer, and not knowing what else I could do, I felt anxious. Then his mother, who had also seen her husband die from a rattlesnake bite, knelt down to comfort her son. She had this look on her face like she knew what was happening, and I just reacted and took a few photographs. Some of the photos showed the pastor’s back, but I didn’t understand at the time why it was such a sensitive thing for them. I thought he was getting better and that he would recover, because a lot of them do. He had been bitten, I think, four other times. So after he died, I was in this complete state of shock. Then the media found out about it. A reporter that I had worked with before told several outlets that I had been there, and they started contacting me. Then news stories started circulating that I felt were disrespectful to the faith and to Mack, so I started feeling like I had to write something. The editors of the Post called me wanting the pictures. I'm not sure that they were initially interested having me write a story, but they offered me the chance to do so, and to publish the photos with it. So I ended up, unfortunately, making the mistake of agreeing to publish the photos that showed his back, too, which really hurt the family. Q: Can you say what the family’s concern was? They want to be seen for the spirit and not the flesh, which was not a concept I was familiar with at all. I had grown up in a pretty liberal environment, where I’ve seen people a lot without shirts, and it didn’t really strike me. I didn’t understand the true significance for them. I didn’t understand the cultural significance or the impact those images would have on his family. It was a situation where there was this media pressure and responsibility to tell a story and inform the public and everything that you’re taught in journalism school, but also trying to balance cultural concerns that I didn’t understand. It was horrible. Q: You found yourself in that situation, and you’re wrestling with, “What am I supposed to do? Do I call an ambulance? Do I call the hospital?” How did you work through that in that moment? I didn’t feel like I could call the ambulance. I think because I felt like I couldn’t do anything, I had to take pictures. I’ve done a lot of psychoanalysis on myself over the course of working on this book. Why did I do the things I did, even though it was my process? I think, for a long time, I used the camera as a way to separate myself from everything, separate myself from unfamiliar, unknown situations, like religion. Because I wasn’t raised with it, it was interesting to me but unfamiliar and uncomfortable at times. Q: And as you said, that’s what news photographers are trained to do. You’re not supposed to get involved. You were shaped and formed by that mindset. That was the background I was coming from, and I hadn’t developed as much cultural awareness or respect as I think I should have at that point. But I have now, working through this whole situation with his family. I’ve known them for six years, but it took about a year for me to re-connect with them and try to make it right. Q: Are you still in touch with them? Yes. I spend Thanksgiving with them every year, so I’ll be going next week. They’re like my extended family. Q: How do you feel about it now? Did you do the right thing, being there and not intervening? Do you second-guess yourself? Did he want medical treatment? And if he did, why and how could I have been so naive or so selfish to be taking pictures? I don’t know. It’s one of those unanswered questions. In the moment, knowing what their beliefs were, was it the right choice not to call for medical attention? I don’t feel like I could have imposed my belief system on someone else. It’s not right, but yes. I felt awful about it, and do still. Q: What impact has all of this had on you and your work? I don’t consider myself a traditional journalist anymore, in the sense that I now feel like I need to be more in conversation with the people I’m photographing and not just be an observer. I like to be involved in their lives. The definition of journalism and photography has definitely changed, especially in the past few years, so there might be more flexibility in terms of what people do. But in the traditional sense, I don’t see myself as a documentarian or a reporter anymore. I see myself as a documentarian and photographer who engages with people more than a traditional journalist would. I consider myself a visual ethnographer now. The work that I do now at Ohio State is primarily with scholars, working on ethnographic projects. Q: Tell us about your work there. I’m the multimedia producer for the American Religious Sounds Project. We record and document “religious” sounds, asking the questions, What is religion? What does religion sound like? Where do we go to listen for it? What can we learn about it listening to it instead of writing about it or photographing it? It’s been an interesting mental shift for me to go from looking to listening. We do stuff that probably would not be considered traditionally religious, like cooking communal meals or fish dinners during Lent, or religious presence at protests. Q: I had not realized until I looked at your website that your photography is primarily focused on faith and religion. You have photographic essays on young Mennonites and biker churches and trucker churches and “American Heathens” and Pentecostals. What unites all of this? I’m not from a religious background. But I have this drive to connect with people who seem really different from me -- which today is an important thing to do, to find ways to connect with and relate to people with different belief systems or ideologies. Part of it for me is looking for ways to connect, and just a deep curiosity. A lot of it is new to me. I’ll go into a community knowing the basics about it but not knowing much about who the people are or how their belief system factors into their lives and cultures. That’s what I look forward to learning. Q: Many of your photo essays are about religious groups that are more or less marginalized. I wonder if there was a rawness or an earnestness, and a seriousness, in these groups that maybe you don’t see in a traditional church setting. I did go to a Presbyterian church when I was younger, and that was what I assumed religion was. The services were not engaging for me. That’s probably one reason I stopped going, and my family stopped going. So finding these sort of offbeat things that were totally unfamiliar to me but that constituted religion or were faith groups -- like I said, I’m trying to find ways to connect with people who are very different or have different belief systems. One thing that I’ve always been drawn to in journalism, and one of the reasons I got into it, was to help increase understanding and awareness and tolerance. That’s one thing I try to do through my photography -- find people who tend to be misunderstood or misinterpreted, and try to help give more context for their beliefs and practices so there can be, for lack of a better word, increased tolerance and understanding for them. Q: Your photos have an intimacy but also a real respect and a dignity about them. They aren’t exploitative, whether it’s bikers or truckers or young Mennonites or whatever. How do you do that? What I really enjoy doing in these different communities is sharing experiences with people. That’s part of it, but so is bringing a part of myself to the table. That helps build intimacy and trust. They see that I’m not there to make fun of them or whatever, that I’m a real person and that I’m interested. I think they feel more comfortable around me in that way. Building that relationship and that trust is what enables the more intimate photography, hopefully. Q: That takes a lot of work. Yes. With [Mack’s] family, I’ve spent six years with them, rebuilding the relationship after I hurt them so deeply. That was a long process, to be able to get to where I am now with them. I don’t go there deliberately to take pictures anymore, but I take my camera. Q: How did you make amends with them? We had a mutual friend who put us back in touch one year after he died. They were having a memorial service that spring, and they said I was welcome to come down for it. That was the first time I went back. I didn’t at first feel like I had the right to take photos of people [there] anymore, because I had hurt them. So I took mainly still-life photos and other things. That was all I felt comfortable doing. Then gradually, I started trying to share experiences with them, whether it was Thanksgiving or just going down to spend a few days and hang out. I’d watch Netflix with them, just sit around and be friends. By doing that, ultimately, I was able to re-evaluate how I use my camera and how to take pictures of people in ways that are meaningful not just to me but also to them, and to engage with people more and see it not so much as a way to just document moments but to capture a shared experience. It’s been a transition for me, between telling a story and sharing one. With journalism, I always used the phrase, “I’m going to tell your story.” But then, how much control? It’s totally in my court, and if I do that, I’m telling your story; I’m taking it from you, and it’s what I’m saying it is, but how is that right? I feel like there has to be more engagement or dialogue. Sharing a story is building relationships with people. The photos, and whatever text goes along with them -- it’s about that shared experience.